Classical Hodgkin lymphoma is comprised of 4 subtypes (nodular sclerosis, mixed cellularity, lymphocyte depleted, and lymphocyte rich). Nodular lymphocyte-predominant HD affects about 5% of people with HD. HD is marked by the presence of abnormal large cells called Reed-Sternberg cells. Reed-Sternberg cells are derived from B cell lymphocytes (white blood cells). Reed-Sternberg cells are specific to HD. They are not found in non-Hodgkin lymphoma. Nodular Sclerosis. Nodular sclerosis is the most common subtype, representing 60% to 80% HD cases. Younger people are more likely to have this type. The nodes first affected are often those located in the center of the chest (the mediastinum) or the neck. Mixed Cellularity. Mixed cellularity is the next most common HD form. It accounts for about 15% to 30% of all HD cases. It occurs mostly in older adults. Mixed cellularity refers to the presence of Reed-Sternberg cells and other cell types. Lymphocyte Rich. The lymphocyte-rich subtype accounts for about 2% to 7% of all HD cases. It tends to affect men more than women. Lymphocyte-Depleted. The lymphocyte-depleted subtype is the least common type of HD, occurring in only about 1% to 6% of cases. It is usually seen in older people and people infected with HIV. It is also more common in developing countries. The cancer tends to be diagnosed when it is widespread, affecting the spleen, bone marrow, and liver as well as abdominal lymph nodes. 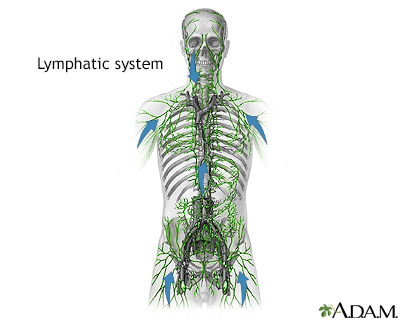 Stage I: Disease is limited to a single node region or has involved one neighboring area or a single nearby organ.Stage II: Disease is limited to two or more lymph nodes on the same side of (above or below) the diaphragm or extends locally from the lymph node into a nearby organ.Stage III: Disease is in lymph nodes on both sides of the diaphragm or has spread to nearby organs, the spleen, or both.Stage IV: Disease has become widespread involving organs outside the lymph system, such as liver, lung, or bone marrow. Refractory and Relapsed HodgkinTreatment is considered successful when the signs and symptoms of cancer disappear. This is referred to as remission. Cancer that does not respond to treatment is called refractory or resistant. Cancer that recurs after remission is called relapsed. Involved site radiation is a type of external-beam radiation therapy. You lie on a table while a machine delivers high-energy x-rays to specific targets on your body. For HD, the most common type of transplant is an autologous procedure, using the person's own stem cells. An allogeneic transplant, using cells from a donor, is more risky for people with HD and is generally used only when an autologous transplant has failed. Allogeneic transplants are sometimes used as treatments for non-Hodgkin lymphoma. They have a greater risk than autologous transplants for complications such as graft-versus-host disease.